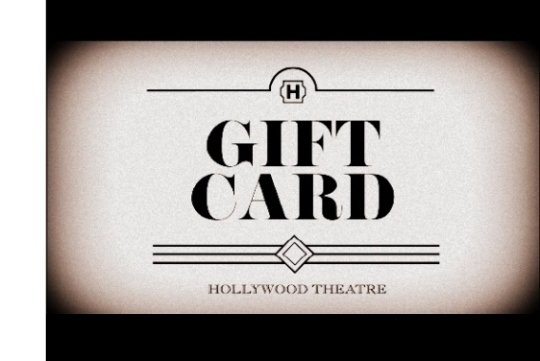 Give the gift of entertainment and Hollywood cheer with a Hollywood Theatre gift card. The gift card has no expiration date and can be redeemed for any film or special event as well as for concessions and merchandise items. Spending the evening cozied up on the new seats with the best popcorn in Portland and a cold beer or hot tea is a great way to relax. For a great date-night gift, a $30 gift card covers 2 full-priced tickets, 2 drinks and a large popcorn. For other dollar amounts, please inquire at the Box Office during regular business hours or e-mail info@hollywoodtheatre.org. Please note that our gift card orders are fulfilled by our out of state ticketing agency. If you need a card right away please stop by the theatre box office during regular theatre hours.